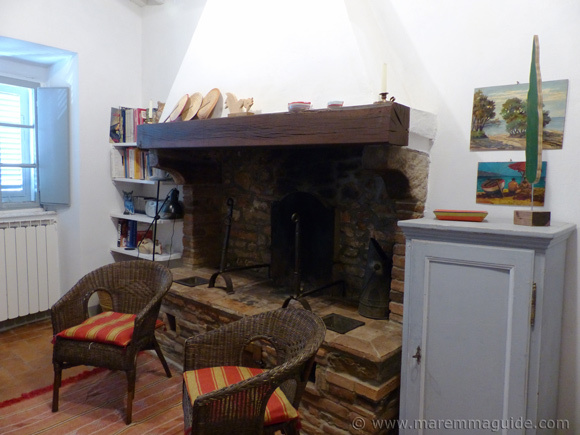 A charming holiday home in Maremma. 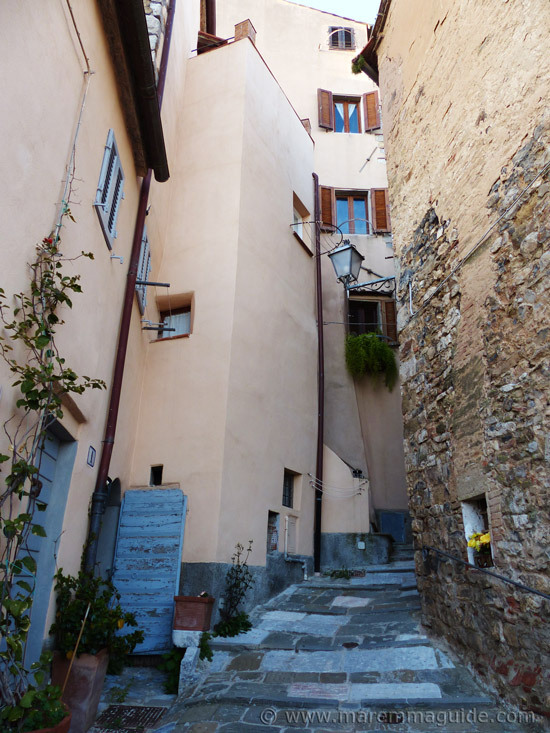 Where dreams of living in Tuscany come true, even if you only have a week or two's vacation. 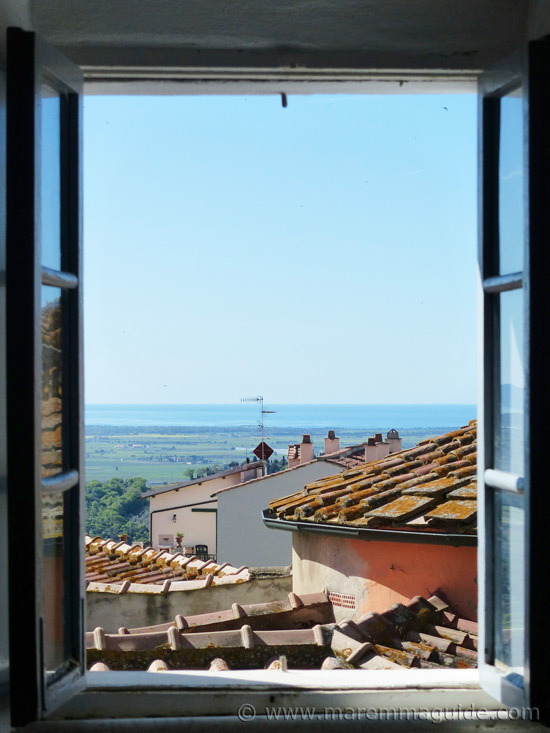 If you yearn to live in an ancient Tuscany house, with terracotta floors, wooden beamed ceilings, and windows with a view. In a pretty hill top town. But aren't planning on moving here (at the moment!). You're coming on holiday. And want to experience what it feels like. Even if it is for just a week or two. And realise that dream. Then I have the place for you. The only trouble is. You won't want to leave! 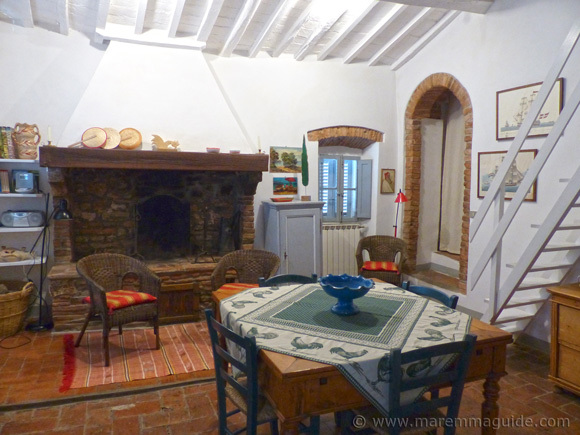 This holiday home in Maremma is a medieval house in the heart of stunningly beautiful Campiglia Marittima and it is Ann's home. Which she let's out to guests with the help of a friend when she isn't there. Ann's house catching morning sunshine. It's April and the Bougainvillea has just opened one flower at its very top. 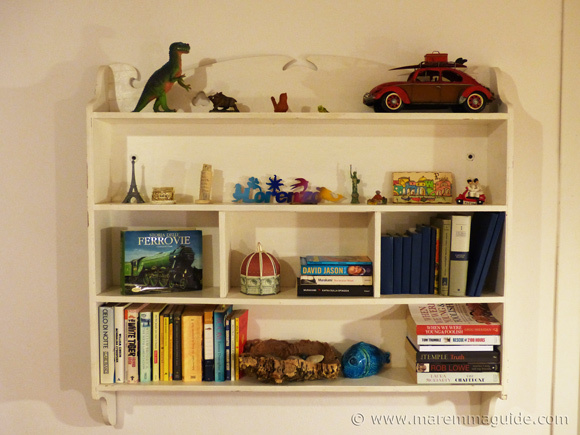 A home from home for holidaymakers who want something different. 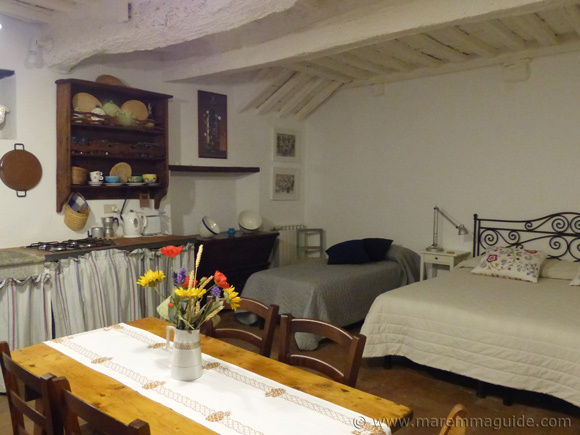 For whom the practical, but predictable, multitude of Tuscany vacation apartments on offer with their change of sheets and clients every Saturday, look great. But just don't ignite any childlike excitement about arriving. 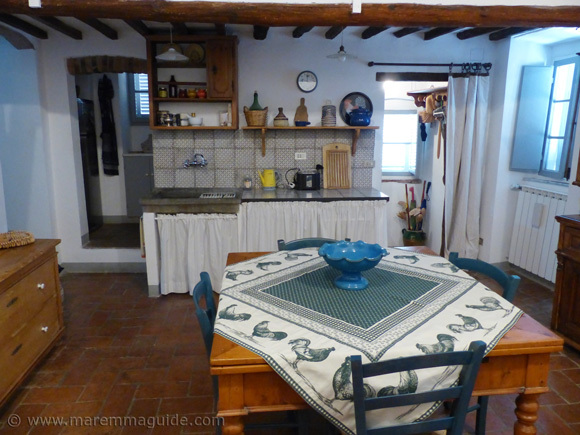 Ann's house is a typical Tuscan home. And, as soon as you walk through its pale blue front door and see the decorations and Ann's family's things, you will know how much it is loved. And cared for. It has everything you will ever want. In a location you won't stop talking about. And. Something very special if you happen to visit in the autumn or winter. As Ann's guests have done so for a month at a time, counting the days to be able to be there to see its blaze. 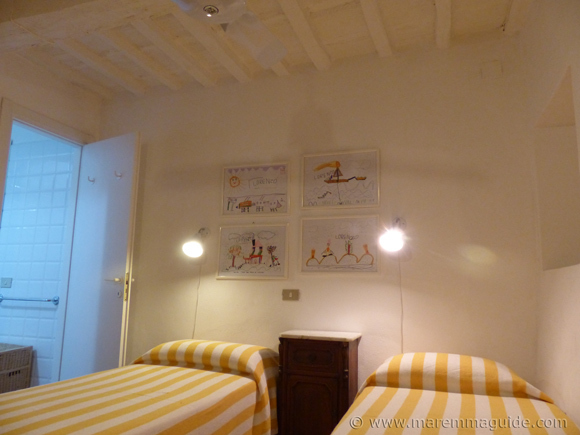 The house is on two floors: upstairs sits above a wine, olive oil, fruit and vegetable shop. Ann's front doors: because she has two! Numbers 1 and 1A. 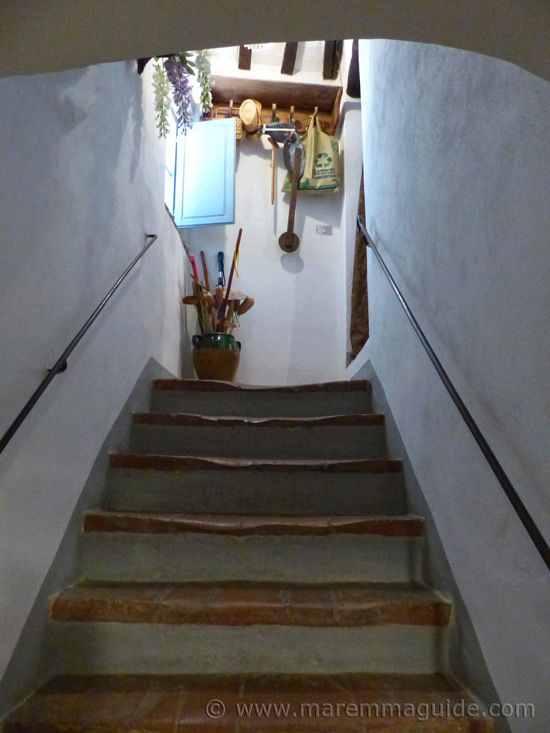 As you walk inside Ann's house there is a staircase on your left to the upper floor and main accommodation. And a stone-paved hallway on your right that takes you to a large downstairs room and a bathroom. Downstairs has it's own entrance door too: the wrought-iron one on the right in the photograph - number 1A. Up the stairs, worn smooth from centuries of feet climbing them. The main room of the house is an open space living room and kitchen. With that "special thing" as its centre-piece: a larger than life traditional, open fire. Called a "caminetto". Made for sitting around and, once lit, is a wonderful sight that will keep you as warm as toast. Tucked behind curtains under the kitchen work surface you will find a family-sized dishwasher. 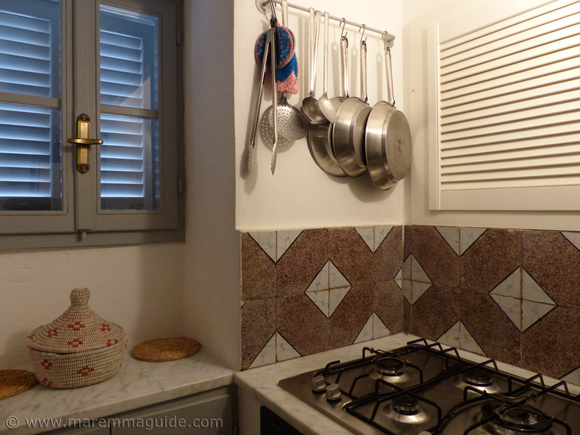 And in the small room to the left the electric oven, gas hob, and full-size fridge-freezer. 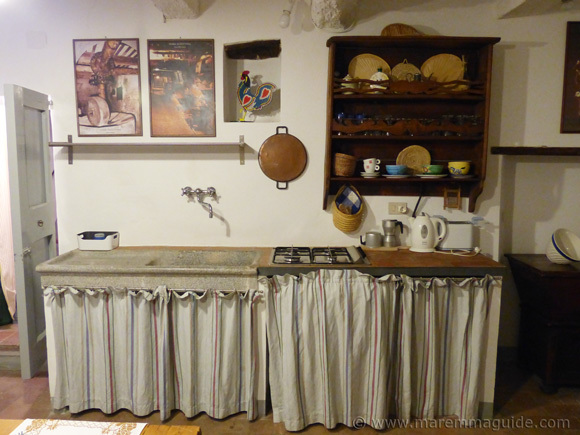 Everything you need to have a go at cooking-up a typical Tuscan meal is there; and what better place to try of you haven't before? If you have run out of basil, or need a lemon or two, you only have to pop downstairs. Find out why below. 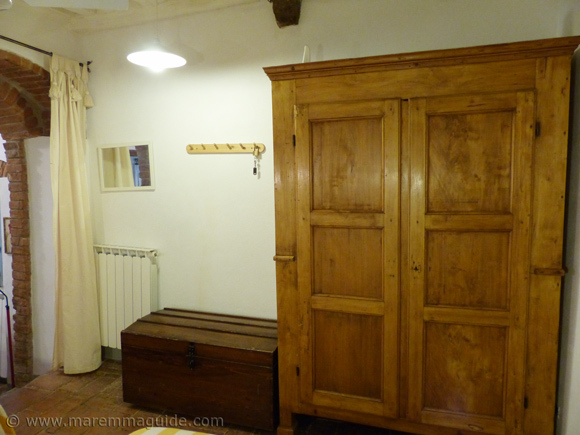 With two single-beds and a lovely large wardrobe. 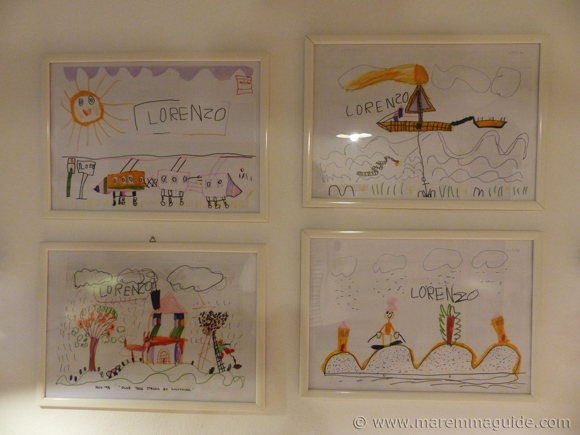 Lorenzo's drawings and his things. The bedrooms are reached directly from the living room. The bathroom on this floor is located between them. 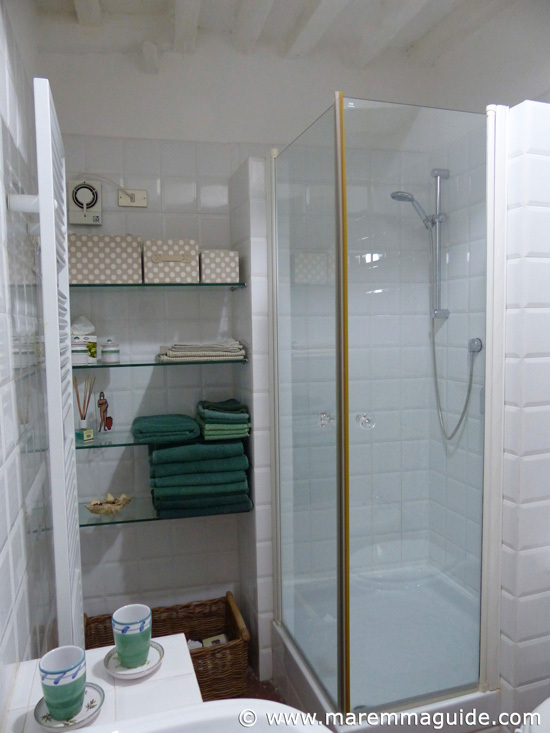 En-suite to both. You couldn't ask for more than the views from Ann's house. 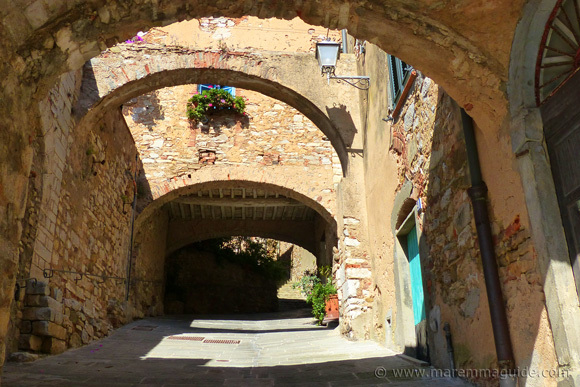 Whether it is Tuscany countryside, seascapes, or the goings on of a Tuscany town. You have them all. The view from one of the side windows looking up. The pale blue of Ann's front door and shutters remind me of France and it turns out that the house used to belong to a French lady. Looking down. That's as far as you have to go for supplies! Because underneath Ann's living room and kitchen is an wine, olive oil and fruit and vegetable shop. Perfect. And for dinner or lunch if you want. 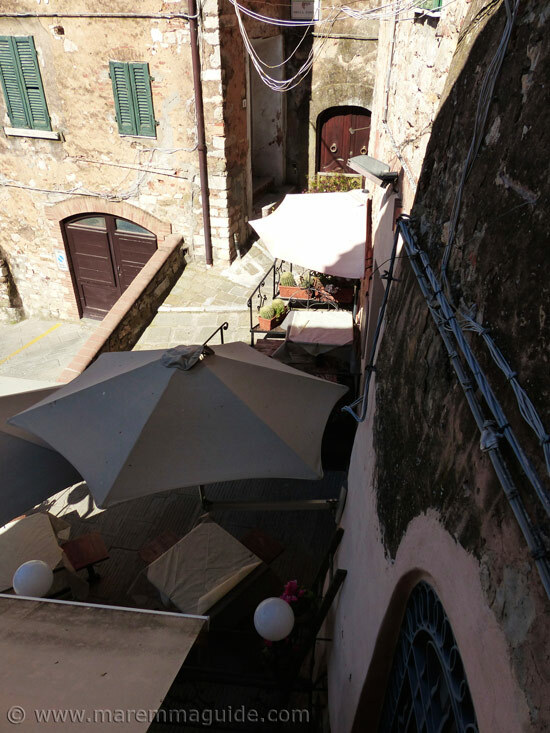 Because the tables and sun parasols next door to the enoteca belong to a trattoria (restaurant). The view out of one of the front windows. The part-painted circular orange building is the apse of the town's church. That sweeps across the Gulf of Follonica, from the port of Piombino in the north, to that of Punta Ala in the south. 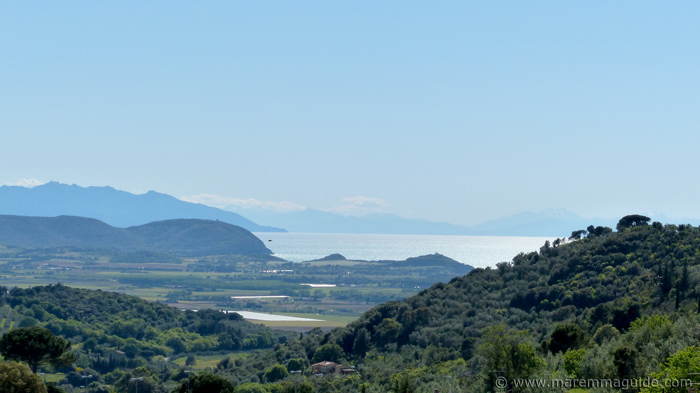 And beyond to the Isola di Montecristo. Looking right. The church of San Lorenzo and Piazza Mazzini. 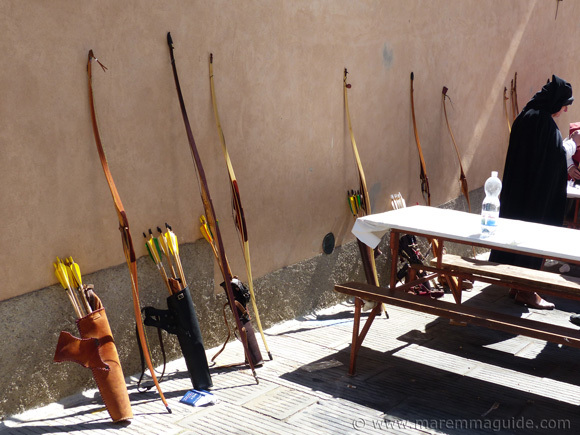 Which, if you happen to visit at the end of April, around Liberation Day, will be filled to bursting with medieval archers from across Tuscany. Male, female and children "arcieri". Eating their lunch after a morning's competition of skill in the grounds of the castle above you. 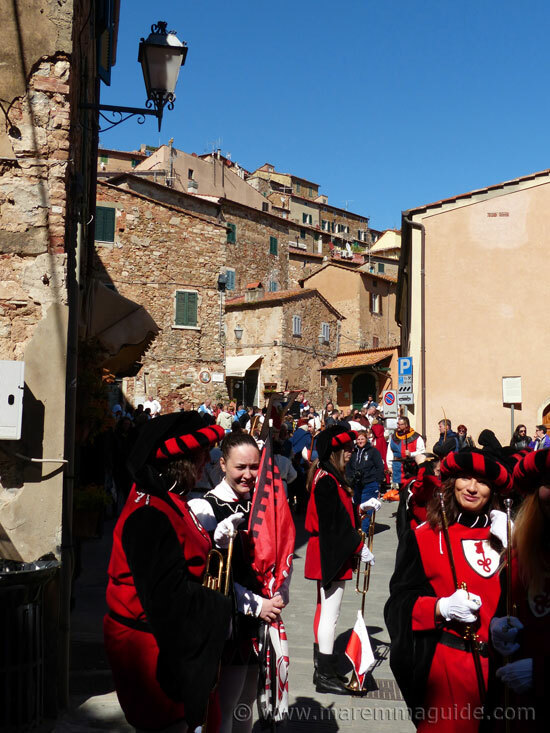 The day of the Trofeo del Drago in Campiglia Marittima is full of colour, sound and lots of laughter and good cheer. The competitors have known each other for years. Some firing their first arrows not long after they learnt to walk! It looks like this with all the bows lined-up and lent against the church wall. Can you spot your house with the pale blue shutters? Take the few paces walk down past the church and through the medieval city gate. 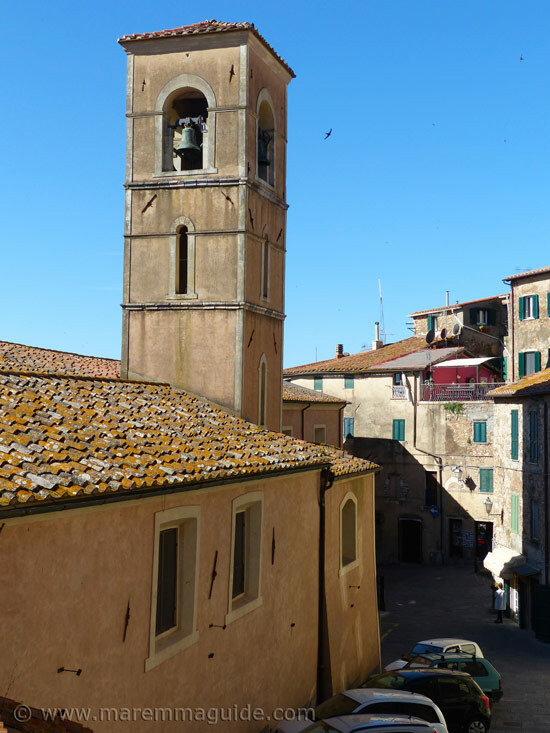 Or up and up the streets behind you to the highest point in Campiglia Marittima, it's castle, the "Rocca Aldobrandesca". And this is the view you will see. On your right. All the way to Corsica. The Costa degli Etruschi - the Etruscan Coast - and the gorgeous (not to be missed) Baratti Bay and incredible Etruscan archaeological site. With the Isola d'Elba behind it. And behind that the island of Corsica. Straight in front of you out to sea. And this. To the left. 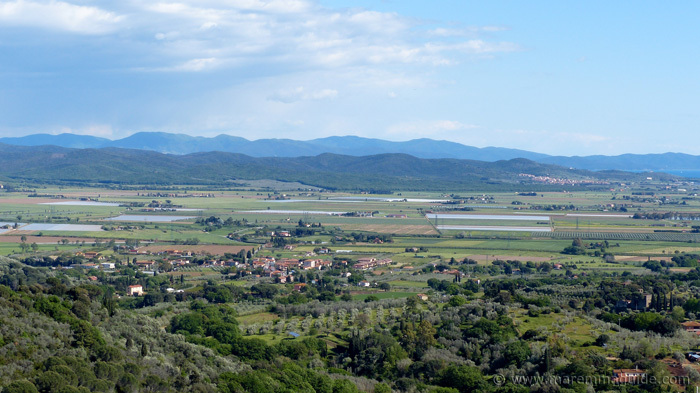 Towards the wooded hills of the Parco Naturale di Montioni. 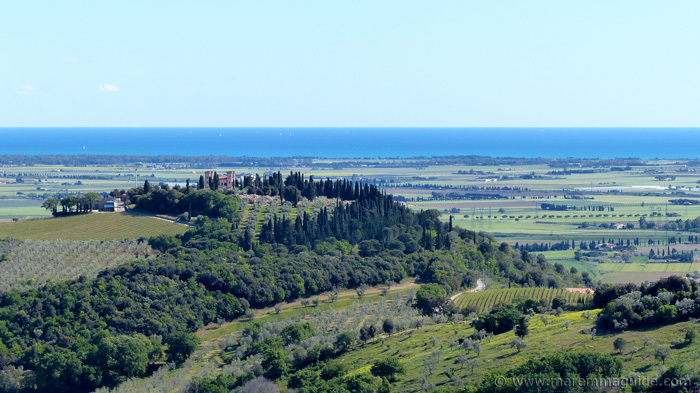 Behind them, the higher hills of the nature reserve of the Bandite di Scarlino, reaching all the way down to the Gulfo di Follonica. The downstairs accommodation is a huge room. 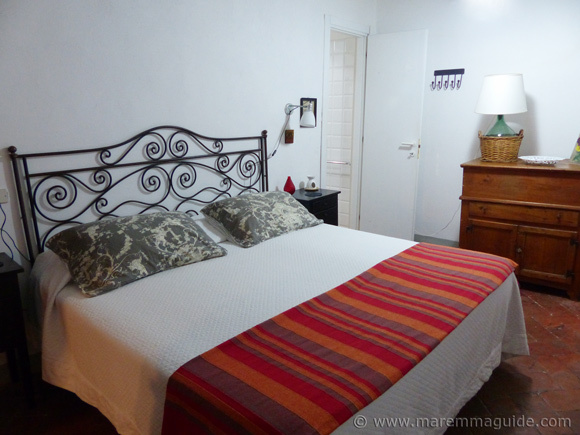 With a double and single bed, and a kitchenette. With gas hob, sink, kettle, coffee pot and all the things you would need to make a brew in the morning. 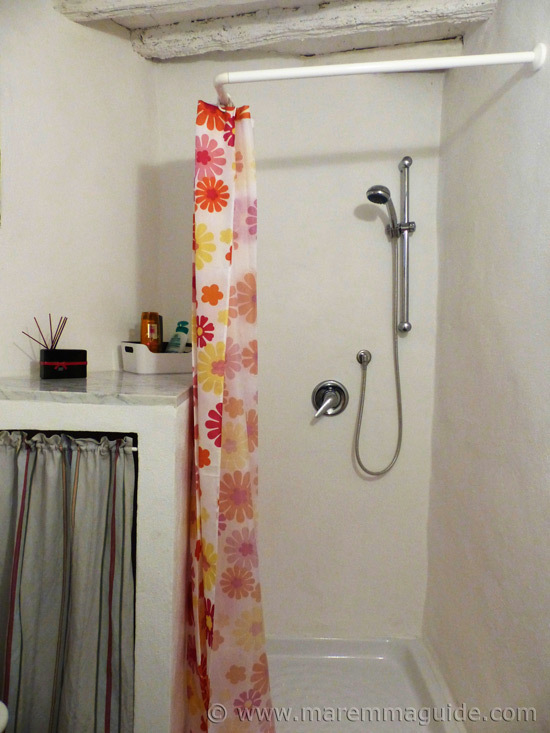 And it's own bathroom with a shower. Tucked away under the kitchen curtains is a washing machine, if you happen to need it. You like to feel snug and at home when you go to bed at night. Even when you're not there. And a child's framed painting on a bedroom wall will bring a smile to your face, rather than evoke critiques of the room's decorations. You take pleasure in new, tiny discoveries. As well as the big moments. Like finding a cheese grater in the kitchen drawer unlike any you have used before. One that will have you wandering how on earth to put the cheese in and get some out! And then have you hunting one down in the local shops to take home because you just have to have one like Ann's. Now I don't know if Ann has one like that, but it is what all of my visitors do when they come and stay with me and use the Italian grater we have! 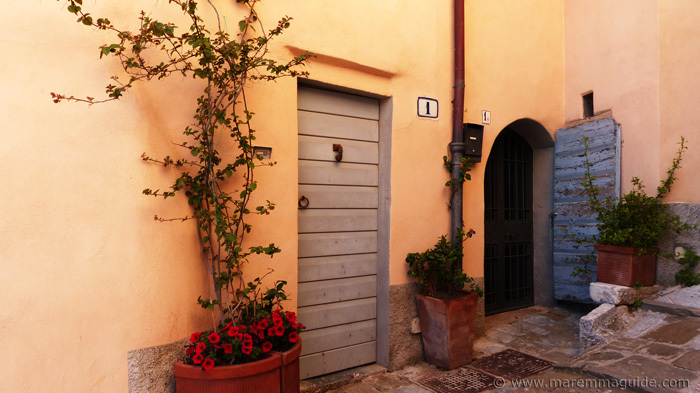 You daydream of tootling out of your front door in the morning sunlight to buy freshly-baked bread and pastries. In Tuscany. To pass the time of day with the baker as you choose which bread and which biscuits you'll take "home". Not because you usually go shopping to buy biscuits every morning to have with your cup of tea or coffee. But because here they are different. And it is what the locals do. To do it again, the next morning. And the next. At which point, when she sees you coming, she will start to put "your usual" in a paper bag. At which point you will either have to chicken-out, or try in the Italian you have practiced to tell her that, "no, voglio provare qualcosa differente" - you want to try something new. 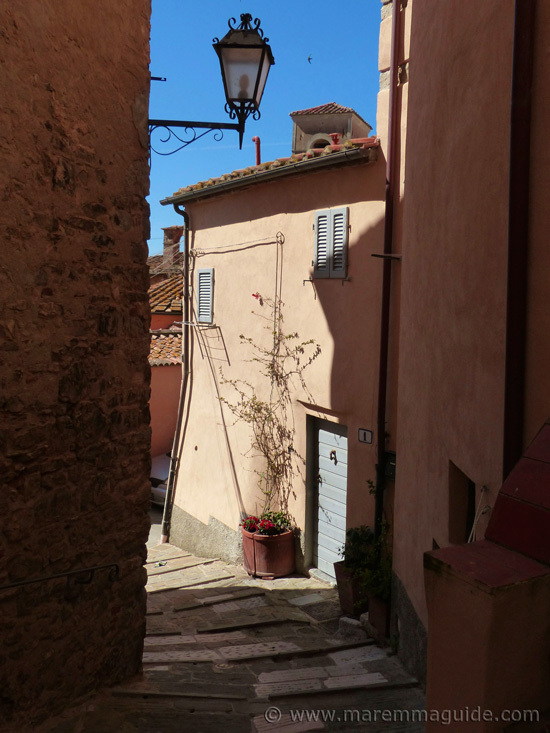 Staying at Ann's you will feel the daily rhythm of life in a Maremma hill top town. A rhythm that will touch a cord deep within your heart. And leave you with a lasting sense of what the Italian way of life is all about. And a longing to feel it again. As you lean out of your blue shuttered windows watching the world go by and dipping low as House Martins swoop in front of your nose. And back again. It will dawn on you. That, in your mind, you have just "called" the people who passed down alongside the church with their cameras and guidebooks in their hands, "tourists". Because you no longer count yourself as one. 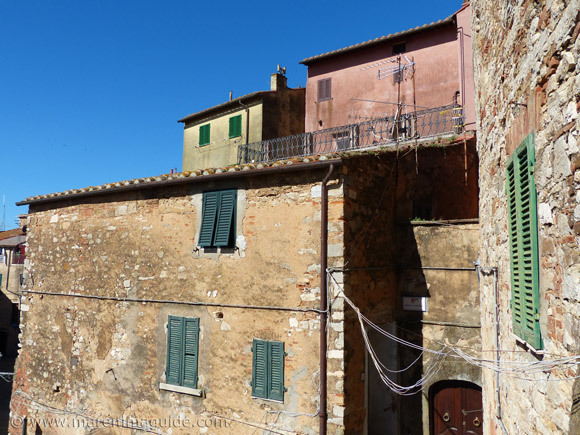 This is your Campiglia Marittima. 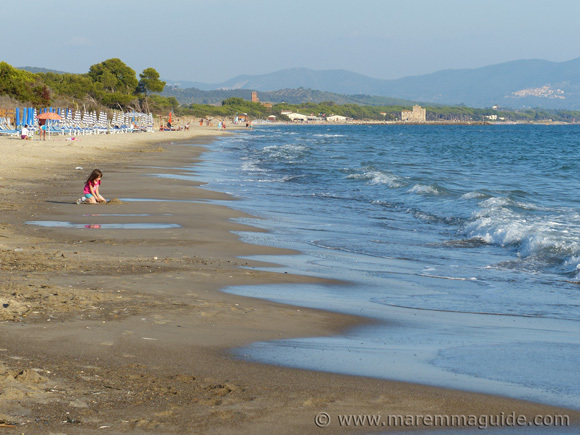 For Campiglia Marittima is a terrific location from which to visit some of Maremma's loveliest beaches. Along that coast you can see out of your window. In less than 15 minutes you can be on a beach in the Parco Costiero di Rimigliano. And in less than twenty, walking through the dunes of the special Parco Costiera della Sterpaia. Or collecting black glitter (mica) on Baratti beach, or snorkelling in Il Pozzino. With a blow you over Etruscan archaeological site right behind you, and a fortressed hamlet - with a tower to climb - on the hill above. Take your children on a miners train through a mountain and trek to an abandoned medieval village on a hill. Tell them about the children of the middle ages who were lowered down the deep holes around it to mine them in the dark, as you pass. 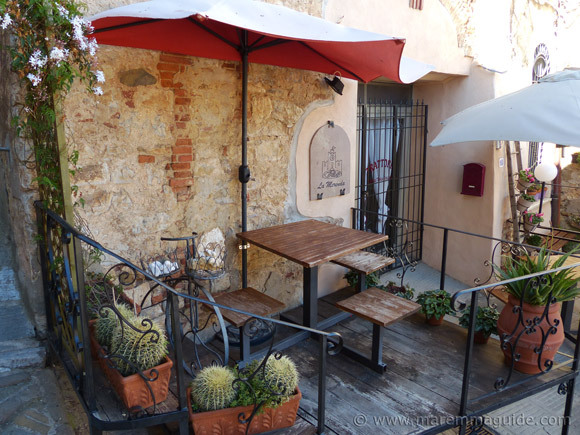 And then head to the enotecas and wine bars of Castagneto Carducci and Bolgheri. 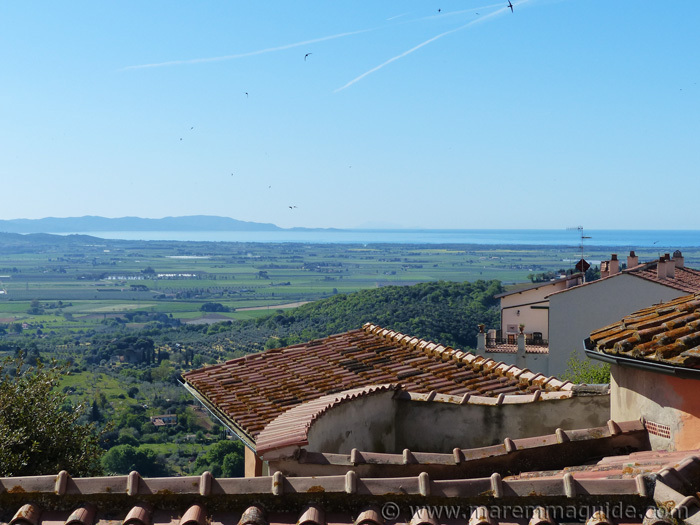 There are few places that are on a par with Campiglia Marittima as a base for exploring Maremma. For a couple. For friends travelling together. And for a family. For first time visitors to Tuscany. For those who have visited many times and want to experience something new. 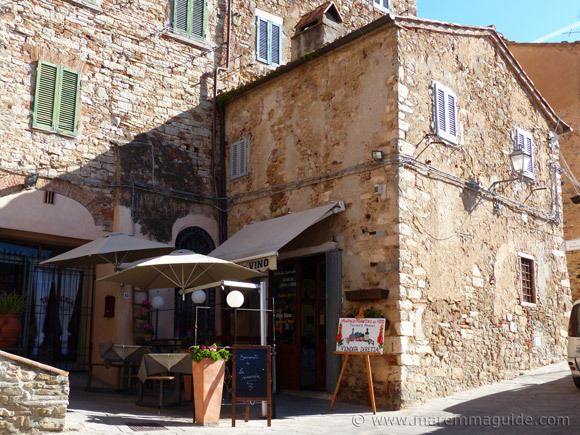 Even if you decide not to stay in Campiglia Marittima, it is one of the places in Maremma that you must visit. Take a look. 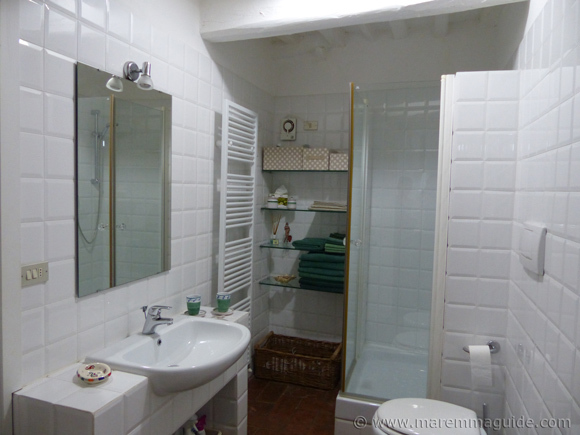 Although Ann's house has three bedrooms, please note that it is only available for rental for a maximum number of four adults (one couple upstairs, one couple downstairs). Or for two adults and two or three children. To have a chat with Ann, for more details and to check availability, send her an email directly via this form.